The heights, successes and perils of hill-surveying. Slieve Snaght was the site of experiments in early surveying in October 1825. Thomas Drummond a Scot, inventor and officer in the Royal Engineers camped out on the top as part of the tests. Their aim was allow the top to be seen from Divis near Belfast, some 106.6km away. The problem was doing this in the often hazy air. They tried using a heliotrope during the day. This is essentially a mirror to reflect the sun. The way that ultimately proved more successful was to use the Drummond Light, an intense light source, which was essentially the progenitor of "limelight" as used for many years in theatres before the advent of electricity. Drummond was on Slieve Snaght with some 12 soldiers and a mini camp ( which included a cookhouse! ) and there were assistants on Divis watching as required. Coordination between the two peaks was obviously difficult and transmitted by letters which took days to travel, with stories of letter-carriers getting lost on mountainsides. The Drummond Light is also interesting and was the most intense light source available in the nineteenth century. Drummond had refined earlier versions of this. It is based on properties of calcium oxide (quicklime). This substance doesn't melt until it reaches 2,572 °C. It can be heated t so hot that it incandenesces a very white colour. The heating was achieved by burning oxygen and alcohol in a flame directed at the piece of quicklime. Another process called candoluminescence whereby the hot gases created by the burning become even hotter than the flame or the quicklime creates further brightness. Imagine therefore a group of men with a magnificent Victorian contraption battling atrocious weather to maintain the light for long agreed periods hoping that someone could see it but not actually verifying this for days. Drummond wrote "The wind encreased to a gale and a sweeping Shower of rain passed over the Mountain... What a Villainous Climate." "However, Drummond, deeply impressed by the terrible situation of Ireland and he had observed during the Survey, had suddenly glided into politics and the Drummond light would never be really applied to lighthouses . 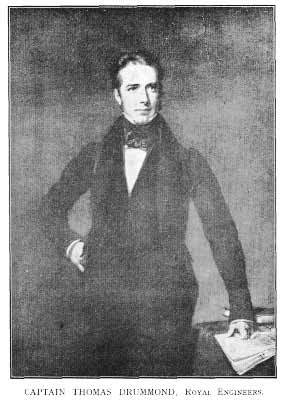 Ireland became Drummond’s adoptive country and he was appointed from 1835 to his death in 1840, as “Irish under -secretary” in Dublin, a very high position in which he acquired “the affections of the masses of the people”. His untimely death was a long - term consequence of “a long and severe illness” caught during the Survey where “ he had suffered much from inclement weather and from frequently standing in deep water”. Let us hope that the hill-surveying that MountainViews does today does not result in any fatalities, delayed or otherwise.